Is a change of government a possibility? I had the good fortune to attend, and speak at, the Nedgroup Investments Treasurer’s Conference during the course of last week. Being a Treasurer in this rapidly changing, turbulent world, is a mightily complicated job. The banking, investment, and money market worlds are complex and are in a considerable state of flux. South Africa’s economic and political prospects are not held in high regard by the ratings agencies: Fitch, Standard & Poor’s and Moody’s. Sad, having enjoyed the ‘most improved’ country ratings between ’94 and ’07 we have declined from BBB+ to BBB, to BBB- with a negative outlook during President Zuma’s term. 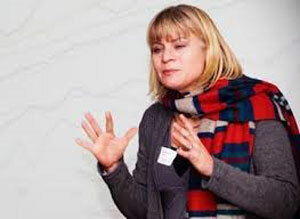 The first was by Nicky Weimar, Senior Economist at Nedbank. 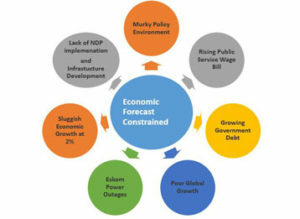 She explained, with a myriad of graphs and tables, that our economic forecast is ‘constrained’ by seven critical components. 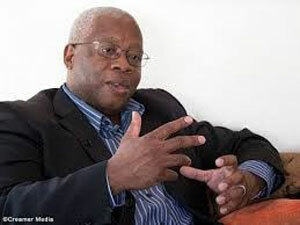 The second was by Political Analyst Aubrey Matshiqi. His ‘State of the Nation’ address explained why the Government has no ‘strategic centre’ and why, if the centre cannot hold, we will lurch from one crisis to another, unable to properly manage or contain them. For ordinary middle-class and other interested South Africans the point is obvious. The crises we face are precisely because we have a sitting government unable to coherently and proactively deal with them. There is, as Aubrey illustrated, no strategic centre. Add to this, as reported by Minister Nathi Nhleko, the 14750 social delivery protests that have taken place over the past 12 months and the 85 police officers killed during the same period – and we have a country, and hopefully an electorate, ready for change. IS A CHANGE OF GOVERNMENT A POSSIBILITY IN 2019? The DA has emerged from a highly successful well-organised and well-publicised conference with its tail up. It has a new leader going into the local elections next year – a wise decision on Helen Zille’s part – with a wider personal attraction where it counts – the black middle class. The ANC, by contrast, is divided, corruption and nepotism are deeply ingrained – something understood and resented by a growing number of sophisticated people who regard the ANC as an embarrassment to the country. It lacks vision and its leader is its biggest liability. 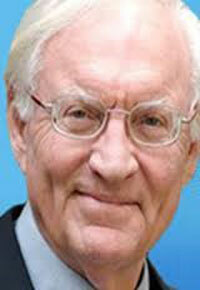 Moreover, as presidential succession comes to the fore, ethnic divisions are likely to surface. The ethnic divisions between the Zulu’s and Xhosas is likely to increase as the succession issue becomes more urgent, with Zulu’s naturally wanting to hold on to power – we believe less and less to protect President Zuma from the criminal charges he faces than purely out of a desire to retain power. 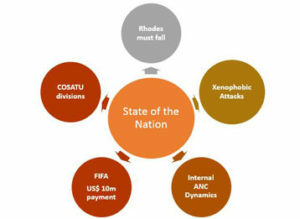 Government is going to become increasingly difficult for the ANC, with a failing economy and conflicting policies which undermine property rights and chase away investors; confused economic empowerment regulations which negatively affect Coloureds; a regulatory policy that seriously hurts tourism, a major source of external income; agricultural policies that will bear negatively on food security. What is also clear is that racism is now endemic in official policy. Desmond Tutu’s “Rainbow Nation” is a faded memory and Thabo Mbeki’s “I am an African” speech, which reverberated so resoundingly and positively is now forgotten. Taking all this together the DA’s election conference and all its consequences seem to represent a new ball-game, with the 2019 general election looking like bringing major changes. What our calculations show is that the ANC is unlikely to gain an overall majority, with the DA emerging as a dominant party. The ANC loses another 10% to the DA based on the DA gaining 30% (conservative) of the vote in 2019, up from 23% in 2014. 10% goes to the EFF which sees its vote increasing by 4%. 8% to a new labour-based working party – which explains the EFF’s lower growth rate. I have written often about the challenge of moving the electorate from a ‘loyalty’ based vote to an ‘issues’ based vote. Will Mmusi Maimane, DA Leader, be able to do this? I have written often about the lack of trust between the social partners in SA: Big Business, Government and Labour and the current focus on maximising self-interest. Will President Zuma’s successor be able to, or want to, change this?I worry that increasingly this lack of trust has resulted in a ‘paralysis’ at the centre of Government. The inevitable consequence is that we once again become a ‘junk status’ country (from BBB- to BB as determined by the Ratings Agencies) with unmanageable debt, as we were in 1994. The local government elections of next year will provide an indicator as to where we are headed in 2019. Will we move into an era of the ANC losing to local, metro, and provincial coalition governments – messy as they may be?Next year’s local government elections will be riveting.